With this in mind, what could be a more appropriate winner than Lars Iyer’s Spurious? The clue is in the title, surely. Beautifully awkward and wilfully absurd, Spurious is a short, funny text that celebrates the lowdown and the everyday. If we are feeling generous, we might compare its two protagonists with any number of other haplessly comic duos: Withnail and I immediately springs to mind, or Flaubert’s Bouvard et Pécuchet, or Samuel Beckett’s Mercier and Camier. But we’re already getting off the point – already lunging towards the classics and forgetting what draws us towards Iyer’s book in the first place. If we want texts of high-standing and lofty repute, we already know where to go. But the exchanges that comprise Spurious are something of an antidote, deflating egos and popping grandiose ideas. It’s a book that is, paradoxically, both below and above literary prizes and trinkets. What better candidate, then, for such a mischievous award? As a child refugee from Europe at the outset of the Second World War, Raul Hilberg escaped with his parents to Paris, then Cuba, before settling permanently in the United States. This traumatic exile formed the basis of a lifelong preoccupation, by turns both emotional and intellectual, which culminated in the publication of his most noted work: The Destruction of the European Jews. 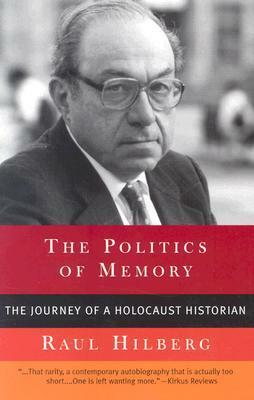 His short 1996 memoir, The Politics of Memory: The Journey of a Holocaust Historian, tells the story of his life.